The almost 1,000 square meters of land are completely fenced - ideal to have pets and small children to play safely outside. The covered terrace at the House Vogelgesang provides a peaceful view of the wide, well-kept lawn. Sun loungers, parasols and garden furniture are available in your own holiday home. Enjoy the quiet for instance with an exciting thriller. 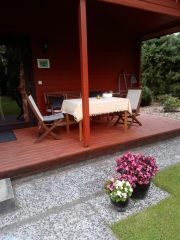 At the BBQ, you can not just do grilling; also breakfast or an afternoon coffee outside in the fresh air are gorgeous. The playground for the little ones is right by the way, easily visible from the house Vogelgesang and the terrace. Park your car in the car parking space, less than 10 yards from the entrance to Hhouse Vogelgesang. The key to House Vogelgesang you get from Ms. Pöttker. She is also your local contact for all matters on site. Im Frühjahr 2013 haben wir eine neue Kühl- / Gefrierschrank Kombination angeschafft. Damit können Sie nun auch Vorräte einfrieren. Der gemütliche Wohnbereich bietet 26' LCD Fernseher (30 Kabelprogramme) mit Heimkinoanlage. Für Regentage gibt es einige Gesellschaftsspiele und eine kleine Auswahl DVDs und Bücher. Es sind zwei Eltern-Schlafzimmer vorhanden, jeweils mit einem komfortablen Doppelbett. Kinder schlafen im Etagenbett. Und für die ganz Kleinen gibt es auch einen Rausfallschutz. Ideal for children playing and free-running dogs and other pets: fully fenced.